The bass for such a small footprint is amazing. Imaging also is as good as it gets and these speakers share the same drivers as the $10K Mahlers with a single 11" eaton woofer! so the difference is how big is the room and how much bass can it handle? 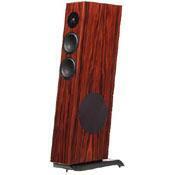 There's a 3d quality Vienna Acoustics speakers have many big name brands totally whiff on. Mine are the Rosewood finish and are beautiful. I listen to just about everything but gospel and country and these are champs. I once thought VA speakers were just 'small ensemble' jazz speakers until I used a good amp! Now these speakers will reproduce anything with speed and clarity. Even though I heard these when they were not placed at their optimum, they were clearly what I was looking for. When I got them home and placed them correctly they really opened up. I can listen to them for hours on end without fatigue. The tonal blance and soundstage are excellent although the bass did need some support with a subwoofer. The bass that is there is very good, but I do like to have even lower frequencies be part of my listening. These speakers are so good that all I have to do is turn up the volume until whoever is playing sounds like they came to my house to play for me. It also helps to have hi quality electronics driving the speakers. I use Ayre amps the this is mariage made in musical heaven. Rock and roll, classical, jazz and folk all sound lovely, the only drawback being that these speakers and the electonics are so good that I am accutely aware of just how bad some of recordings are. The flip side is that when the recording is good to great these speakers really sing! They give loads of detail and nuance giving music real emotional heft. I was considering B & W 802's and I bought these instead. Actually there is very little difference I could detect between these and the B & W's, but these cost less. To me that makes them a relative bargain. These are speakers for music lovers. Natural and open sound, with a very big and realistic soundstage. Can play very deep bass and loud without dynamic compresion. Nice woodwork and finnish. Speaker terminals are with a very tiny hole, so if you want to use heavy thick cable, you can not use bare wire.....They have to bee terminated with bananas ore spades. My setup is: SME 20A/SME V turntable/tonearm, and Denon Dl-103 cartridge. Gryphon Phonostage and Headamp. Audio Research LS-2B preamp. Mark Levinson No.29 amp. Denon DCD S10 MK2 + Marantz CD16 cdplayers. Kables are Kimber PBJ and Monocle X, Van Den Hull MCD-502. Warm, musical midrange, solid bass and smooth highs. Pinpoint imaging and soundstaging. Beautiful finish = high WAF (Wife Acceptance Factor). Careful room placement is madatory. You cannot place these speakers up against the wall, especially rear wall (because of the rear port bass bloat). Also, if you want to get the best out of them, match them with high quality components. Garbage in/garbage out. These are the finest speakers I've ever owned, period. They offer pinpoint imaging, which a warm musical midrange, deep bass and detail, yet none fatiguing highs. To hear what these speakers are capable of, you really need to be careful with placement and matching them with quality components. Tweeter wasn't the best at set-up, they had the speakers too closed in and they were driving them with a B&K receiver. Bass sounding boomy and over-bearing, and the soundstage was small. When I tried them in my home, I pulled them farther from the surrounding walls, and drove them with high quality amps (Clayton Audio M100 monblocks). They opend right up. The bass tightened and the midrange, especially vocals, just floated out into the room. Imaging and soundstaging are as good as you can gets, as good as the Audio Physic Virgos' that I'd heard, but able to play louder with more bass. The Santos Rosewood finish also has a very high WAF. Audio Physics Virgo, B&W Nautilus 802, Sonus Faber Cremona, Soliloquy 6.3, Vandersteen 3A Signature, Legacy Focus, Silverline Sonata II.